Nothing spoils a summer swim in your favorite lake like an algae bloom. These become more common as the weather warms up. Earlier this week, aquatic biologists treated a lake near Seattle with a new product to prevent toxic blooms. Most every summer until last summer, Lake Lorene would turn pea soup green. Darcey serves on the Twin Lakes Homeowner’s Association board. 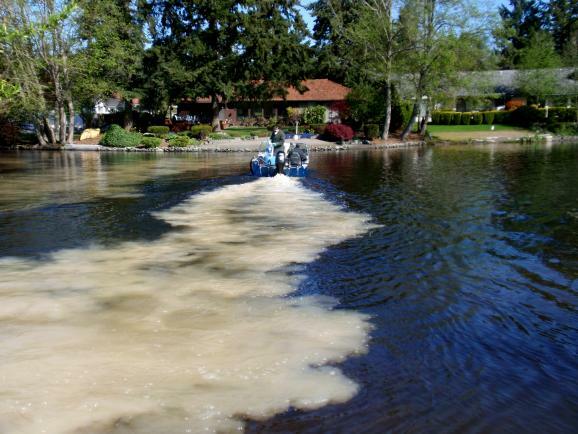 Last year, the homeowners group gambled on a new approach to restore water quality at the lake in suburban Federal Way, Wash.
Darcey and his neighbors are the first in the Northwest to hire a company to apply a new algae treatment. The problem here is similar to so many other built up lakes. Stormwater, goose poop, fertilizer runoff, all carry phosphorus into the lake. That dissolved phosphorus is the key nutrient for algae growth. Left unchecked, blue-green algae can turn toxic. It can make people sick and kill pets and livestock. Earlier this week, aquatic biologists treated the lake with a new product to prevent toxic blooms. A three man crew in a small work boat crisscrossed the lake and a brownish plume spreads out behind the boat’s stern. AquaTechnex aquatic biologist Adam Kleven explained that the crew injected the eight acre lake with a follow up dose of the new mineral treatment, called Phoslock. He says the slurry is a combination of the element lanthanum and powdered clay. “What this product does is drift through the water column, binding with the phosphorus and permanently locking it down in towards the sediment,” Kleven says. Nigel Traill of Phoslock Water Solutions says the treatment was invented in Australia in the mid-1990’s. His company exported it first to Europe, found success there, and now is coming to North America. Traill’s company points to a list of studies that show their product doesn’t hurt fish or contaminate drinking water. It is expensive, which could limit sales. Terry McNabb of Bellingham runs the lake management company AquaTechnex. McNabb gave a price range of $1,900 to $4,000 per surface acre treated. The two Phoslock injections at Lake Lorene cost the homeowners association there around $40,000, which includes some ancillary permitting and monitoring fees. McNabb calls Phoslock an “important expansion” of the tools available to control algae. McNabb says the new lake treatment is cleared for use in California and Idaho. He’s still waiting to hear from Oregon. Washington’s Department of Ecology is keeping Phoslock on an experimental permit. It’s watching for any negative effects. An agency spokesperson says the state would rather people living around lakes take measures to contain sources of phosphorus on land. That way they wouldn’t have to put any chemicals in the water in the first place.